It’s hard to believe that summer is almost over. I’ve been in a bit of a dreamy place the last week or so, and in the midst of that, I put together two new moodboards that capture some of those thoughts and dreams. The first one (above) is more end-of-summery, while the second one (below) is more in anticipation of fall and all that fall might bring. Together they show a heart filled with plans for adventure, dreams of making art, and taking risks for God. I could write quite a bit about each image and what it means to me right now, but I think I’ll let the images speak for themselves. Thursday, July 23rd. // Who are others you admire WHO are living/celebrating a similar season well? What resources/books/posts have encouraged you? 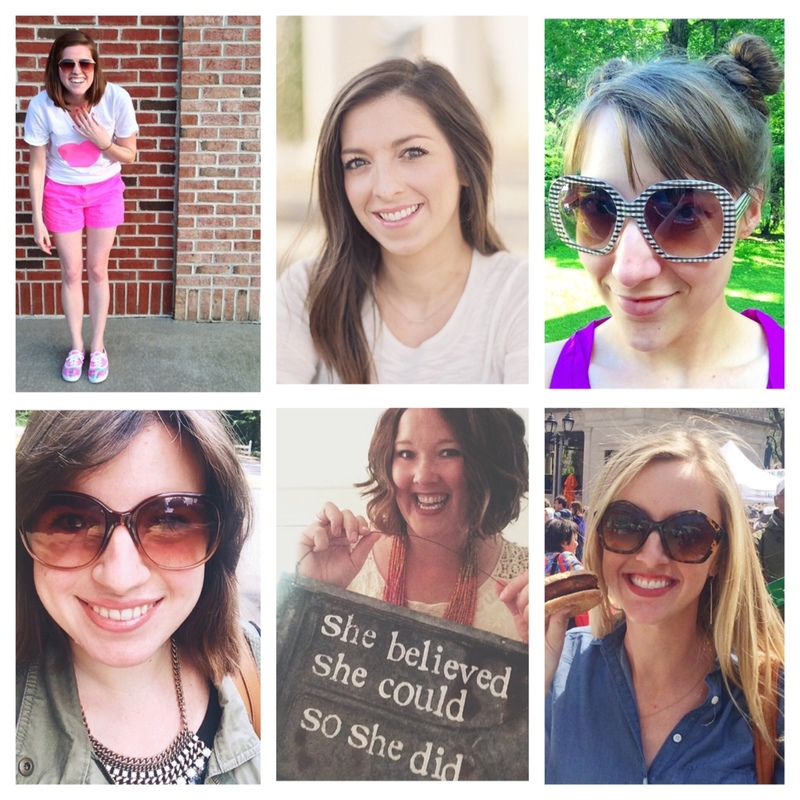 These amazing ladies are some of my favorites to follow in this season of life, and I’m excited to introduce them! 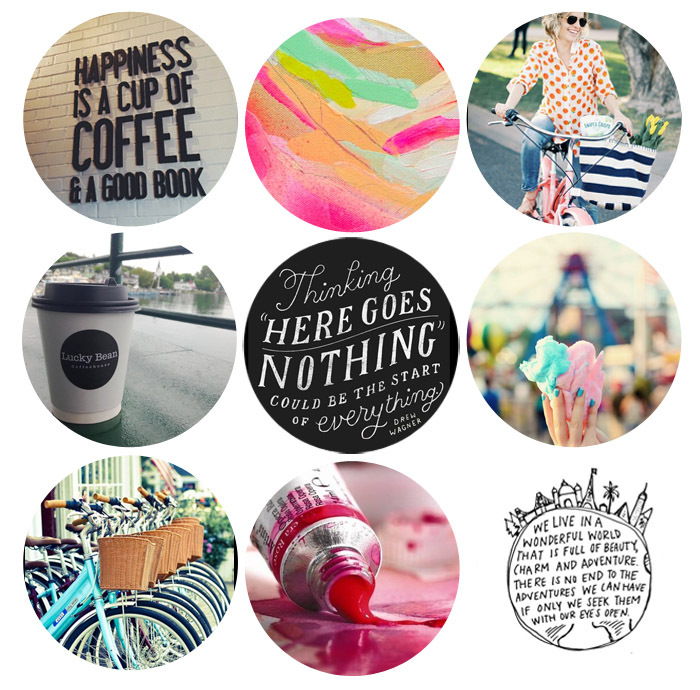 MEET CARRIE: Carrie’s Instagram is full of colorful encouragement! She has the sweetest, most giving heart, and I’m fairly certain that even though we’ve never met, we could become fast friends, bonding over bright colors, polka dots, and living each day with thankfulness and joy! MEET NATALIE: Natalie Metrejean has created an incredible devotional for single ladies (see below), and she is daily encouraging other single women to embrace their season and live a full, meaningful life. So lucky to call her a dear friend! MEET NATALIE (YEP, TWO NATALIES! ): Natalie of Good Girl Style is fabulous in so many ways (and another lady I am so lucky to call a friend). She’s stylish with a fantastic flair for vintage, a fellow latte lover and coffee enthusiast, an amazing and inspiring poet, and above all, she loves the Lord in a really brave, beautiful, and faithful way. She’s currently walking through an incredibly tough season, but she still shares with honesty and joy. MEET BAILEY: Bailey has become such a sweet online friend, and I absolutely adore her heart for living fully and savoring her season. 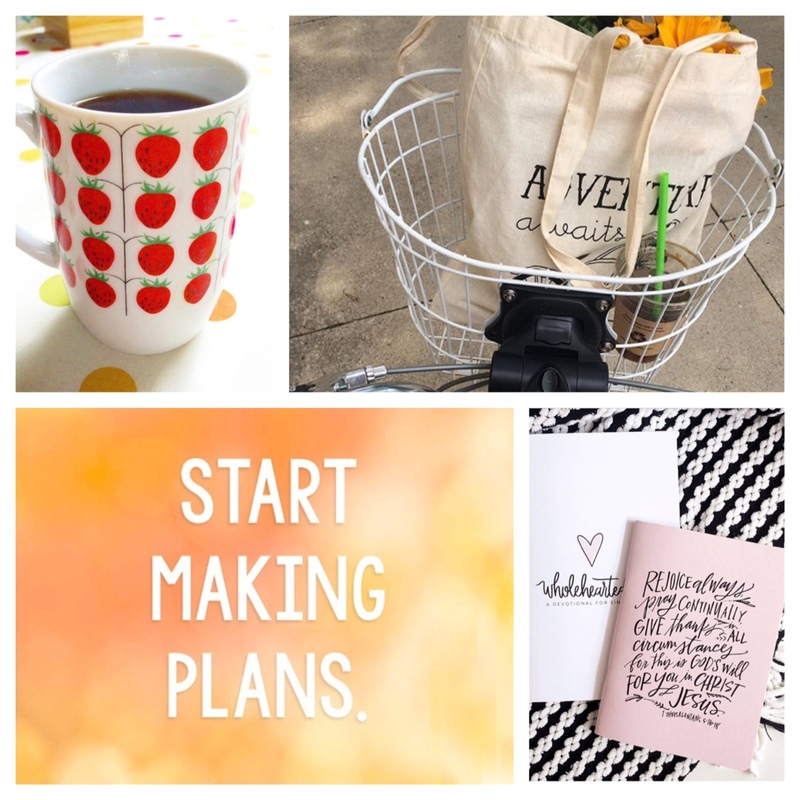 Her blog and Instagram are just chock full of creative inspiration — from books to read, quotes to remember, adventures in life and theatre, and crafty Project Life pages that celebrate God’s goodness and all He is doing in her life. She will encourage you to live, dream, and create with courage! MEET EMILY: Emily reminds me often what it looks like to be beautifully content in the Lord. She is an encourager, a cheerleader, and such a sweet spirit and friend. You’ll find peace, rest, and inspiration in each of her lovely posts! MEET ALI: Ali has written some pretty spot-on blog posts about what it’s like to be single in your 30s (see link below). This girl is living proof of how to rock the single life, too! You’ll love following her adventures in food blogging and making the most of life! God has big plans for us — adventures to embark on, passions to pursue, and things to discover that will make our hearts happy and bring us indescribable joy and excitement. He has plans for us to participate in His Kingdom and make a difference in His name. Ephesians 2:10 is one of my favorite sections of scripture, because it’s a reminder that we are God’s handiwork, created to do good things that He prepared in advance for us to do. In my own journey of faith, I’ve found that the more I understand who He is, the more freedom and courage I find to become the truest version of myself. I like the use of ready as a verb. It’s about being prepared and equipped. And it holds a bit of strength, possibility, and hope in it. I want a heart made ready. I have begun to pray that God would do that kind of work and preparation in me. 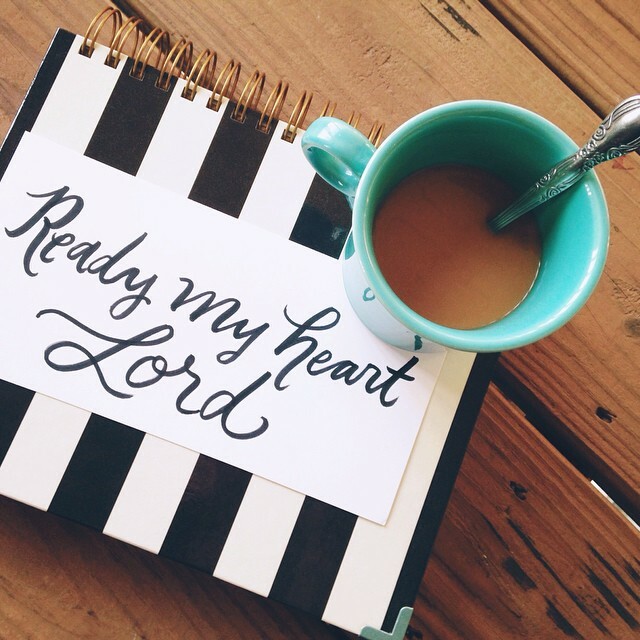 That He would ready my heart, prepare me, equip me, sustain and support me. That He would comfort and cheer me, embolden and encourage me. That is my prayer for both the big and the small moments — from the day to day routines of right now, to the unfolding and changing seasons ahead. I pray for my heart to be made ready. And in my asking and praying, I seek and know Him and His faithfulness more fully. I recently picked up a set of prayer journals from Val Marie Paper. I love the concept, and her designs are just beautiful. I look forward to filling the pages with prayers, scripture, and thankfulness, watching the faithfulness of God unfold. Join me in praying for ready hearts to follow Him? Ready my heart for this day, for the work you have for me to do and the people you have for me to love. Ready my heart to write and create for you. Ready my heart to continually seek you, finding you despite fear or doubt or busyness. Ready my heart for all that this day holds. Sometimes, life feels like a lesson in letting go, an adventure in not knowing. Lately, I’d say that’s especially true for me when it comes to dating and my hope for marriage. As I watch life change and unfold for those around me, it’s hard not to wonder what’s going on in my own story. It’s hard to be patient and hard not to feel stuck. I love what Megan Gilger had to say about patience over at The Fresh Exchange: I begin to wonder if I am doing something wrong, or if I haven’t tried hard enough, when in truth I try to remember it simply isn’t my time yet. The time will come, and it will come just when it should. When I think about the weight of what I am waiting for, I begin to realize that I still need this time here in this weightless freedom in order to prepare for what will come. As many of you know, I’ve been praying to meet and marry my best friend for years, so I can definitely relate to wondering if I’m doing something wrong, or not trying hard enough when it comes to meeting and dating said best friend. But the lesson God has been teaching me lately is that sometimes, we really do need to just let go and be open to life as it unfolds. Because letting go allows us to more fully live right where we are. It sets us free from trying to control what we were never meant to control in the first place. Letting go is a brave yes to following God and the plan He has for our life. Oh, but sometimes it’s a hard yes to say, isn’t it? I am a go-getter. I dream, set goals, make a plan, and then start marching toward those goals and dreams. But I’m realizing that doesn’t really work in dating. Sure, I can do all I can to be ready to begin that next chapter, but there’s not much I can do to actually get that chapter started. I have to wait for God. Little by little, I am letting go of the expectations I have around this area of my life and the way I think things should go. I’m learning to ask God what He wants for me now, in this season, and I’m learning to trust Him with what will unfold in the next one. And while some might view letting go as giving up, I’ve found it to be the opposite. Letting go brings me hope, and it strengthens me in the waiting. As I keep saying a brave yes to letting go and following God, I’m learning to be thankful for my own unique adventure of not knowing. And I’m grateful, so grateful, that God holds every bit of that adventure in His creative, loving, and faithful hands. 1. Take a course or class on a subject that interests you (post-college). Pick something that helps you explore who you are and what you love (it doesn’t have to have anything to do with your career, so don’t feel limited by that). I took a collage art class shortly after graduating (something I had started to develop an interest in, but really knew nothing about), and as a writer and an editor, it was fun to explore the visual side of things! 2. Buy an original piece of art for your home (it doesn’t have to be expensive). There are so many options on Etsy, at local craft fairs, etc. The original paintings and illustrations I’ve added to my walls over the years are so special, because in most cases, I know a little bit about the artist who created them, and I love being able to support them in their craft. 3. Figure out if you’re an introvert or an extrovert and embrace how you best recharge. Once you discover how you most fully rest, you can make it a point to intentionally choose the kind of rest that most replenishes you. 4. Explore your faith, and get active in a church community. Ask questions, learn what your faith means to you, and embrace being a part of a faith-based community. Find people you can be vulnerable with, grow with, and learn with. I would say this is one of the most important things you will do in your twenties, because it sets a foundation you will rely on for years to come. 5. And as a second part to #4, find out what seeking the Lord looks like for you and make that a daily practice. (Is it rising early in the morning before work to read your Bible and pray? Or are evenings the best time for you to quiet your heart and listen?) Create a daily rhythm that naturally becomes a part of each and every day. 7. Find a mentor, a counselor, or both…someone wise (and older than you) who can help you navigate some of the questions you’ll face in your twenties. Being mentored/counseled is one of the best and healthiest things you will do for yourself. 8. Live on your own. Rent a small studio, an apartment, a house with roommates… Learn to be comfortable on your own and discover all you’re capable of doing. 10. Learn what your own unique style is when it comes to fashion, decor, etc. — and boldly embrace it! When I moved into my first apartment, I had no idea how I wanted to decorate. It was such a hodgepodge. My wardrobe was similar. I wore what I wore in college. But as I slowly started picking things I really loved (both for my home and my closet), a specific style started to emerge: bright colors and patterns, charm, whimsy, a little bit of a retro twist. You can even use Pinterest to help you track and discover your own unique preferences. Have fun with it! 12. Take yourself on a date...out to breakfast, coffee, to a movie, the park, etc. Don’t be afraid to experience life on your own. 13. Create a budget, save, and make your first “big-girl” purchase.…a car, a couch, whatever! 14. Give back to your parents, even if it’s just something small like treating them to dinner. It’s a special thing to be able to say thank you and return some of the love and support they’ve given over the years. 17. That said, every once in a while, treat yourself to a fancy dinner and dessert — just because. 19. Keep a journal and document life in your own beautiful way. 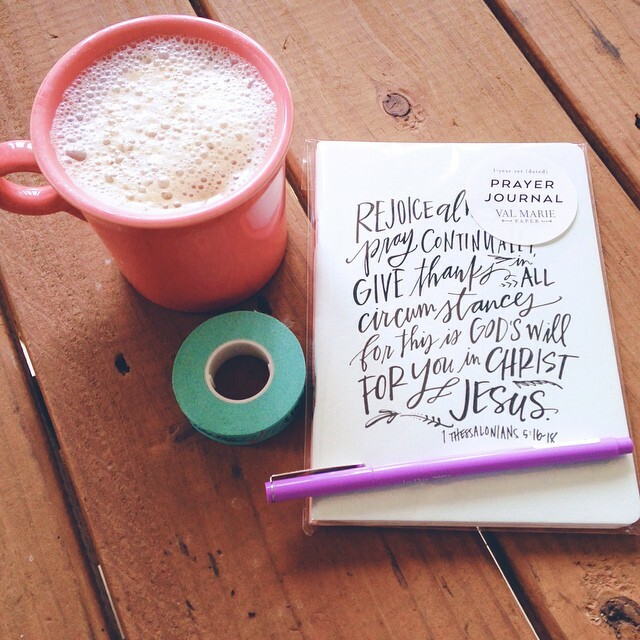 Write or illustrate your hopes, your dreams, your prayers, your memories, what you’re thankful for…I love looking back through my journals and seeing God’s work in my life. 20. Make a list of hopes and dreams and/or a vision board for your life, but don’t be so tied down to your plans that you can’t experience the blessing of surprises and divine redirections. Seek God daily, asking Him to shape and direct all of the plans of your heart. God made me a dreamer. And not just a daydreamer, but an encourager of others’ dreams. I love to talk about God-sized dreams with the people I’m blessed to share life with. Dreams and the inspiration behind them are some of my favorite stories to hear and tell. But being a dreamer sometimes gets a bad wrap. Those who dream aren’t always viewed as do-ers, makers, and chance-takers. Instead, they’re often thought of as impractical and unrealistic. Being a dreamer doesn’t have to mean constantly living inside a world of make-believe and impossibility, though. It’s possible to be a dreamer who DOES. Start your dream with God. Asking God to place His dreams on our hearts is truly the first step in becoming a dreamer who does. The dreams we could come up with for ourselves pale in comparison to the dreams He has for us. I often dream with God on the pages of my journal, and as a writer and creator, I’m constantly seeking to keep Him at the center of my creative process — from the dreaming to the doing all the way to seeing the dream become reality in His perfect time and way. Ask God what He dreams for you and your life and how He wants to use your gifts and passions and loves. Then quiet your heart to listen and get ready for an exciting new adventure. Take small steps with big courage. Dreams aren’t chased and caught in a day. The biggest dreams become reality with small, but steady acts of faith and courage. 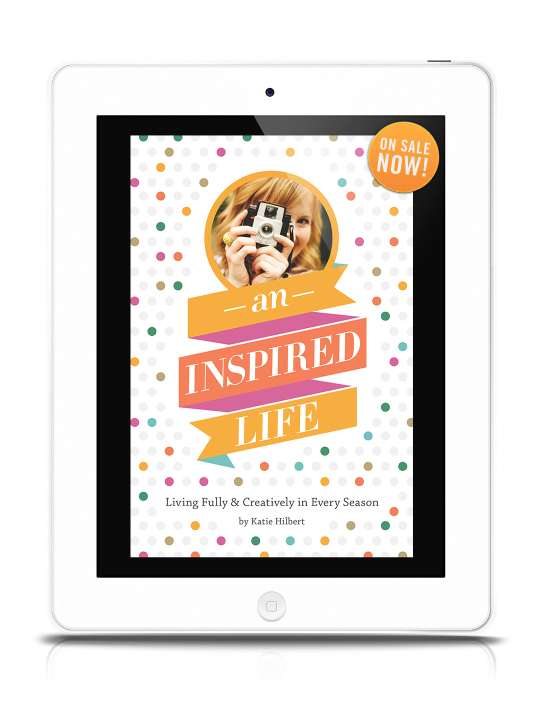 It took me almost a year to write my eBook An Inspired Life (a huge dream of mine!). When I started, I envisioned the whole process going much faster, but as I journeyed through the adventure, one of the biggest lessons God taught me was: don’t rush the process. There was purpose and value in each little leap of faith — from the initial idea, to the writing, refining, designing, publishing, and promoting. God showed me the importance of being present and focused during each of those phases. And rather than rushing to the end of the process with one giant and unsteady leap — or being too afraid and overwhelmed to even begin at all — He asked me to take small steps with big courage and let Him lead the way. What’s the next small step you can take that will bring you one step closer to the dream God’s placed on your heart? We aren’t meant to journey through life alone, and I believe we aren’t meant to pursue our dreams alone, either. God’s blessed me with a precious community — both online and off — of friends and family members who are a regular part of my life and the dreams God has placed on my heart. They encourage, they pray, they advise. And I do the same for them. I also hope to have this in my marriage someday. I hope and pray that my future husband and I will be dreamers and doers together. Think about who your dream team is — or who you would like it to be. Do you make it a point to share your dreams with them — and listen to theirs? What’s one way you can be more intentional about time with your dream team? I hope and pray that by sharing my experiences with you here, you’ll find even more passion in your heart to DREAM and DO. I hope you give thanks for your God-sized dreams. And I hope starting right now, today, you’ll start prayerfully taking small steps toward them. Despite the unpredictable (and mostly windy/overcast weather), I spent my Saturday surrounded by color and inspiration — eating good food, drinking hot coffee, and wandering around Crafty Mart’s Spring Mom & Pop Shoppe. As I mentioned in my previous post, I love the Crafty Mart events, because they bring together a unique group of local artists right in the heart of Akron. It’s such a joy to celebrate talent and creativity and support people’s passions. This is Ashley, the owner and creator of Truckshop. I fell in love with her creatively curated mobile fashion boutique (check out all of the bright color, sparkle, and polka dots!!). She was so much fun to meet and talk with, too. I loved hearing her business story, and talking with her further confirmed my dream to work with creators, makers, and dreamers to help them live and tell their inspired stories. So sad she didn’t have the polka-dotted number in my size. I was smitten! I did snag these sparkly earrings and fun black-and-white chevron scarf, though. Also, did I mention there were mini donuts?! I also came home with this darling piece of art by Ivy Axe. It’s the perfect addition to my little gallery wall of art. Filling my home and life with beautiful art makes my heart very, very happy. It was a great day, and I think it was just what I needed. I feel refreshed and ready to tackle some new creative projects of my own! I went to my first Crafty Mart show (and the very first Crafty Mart event!) about 4 and a half years ago, shortly after moving back to the Akron/Cleveland area. It was the start of a new season in my life, and I loved connecting with and supporting other local artists. It was a chance to rediscover the area, as well as explore a new dream of mine — selling my art locally. Crafty Mart offered me that opportunity, and since attending that first show, I’ve sold my collage art at three of their events. While I’ve since taken a little break from participating in craft shows, I’ve continued to be a regular at the Crafty Mart events, and I’m excited to announce that the next Crafty Mart is this weekend (Saturday, May 3 10 a.m. to 5 p.m.!). If you’ve never been, I recommend making an afternoon of it. Grab lunch at Urban Eats — and a coffee for dessert — (I love the caramel soy latte! ), and take your time exploring the more than 50 vendors being showcased. 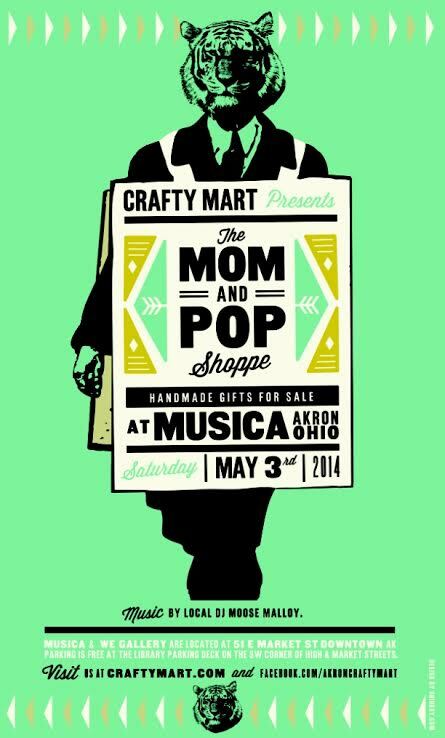 Crafty Mart takes place at Musica, an awesome venue in the heart of Akron, and the urban atmosphere really adds to the event. And bonus: This Saturday’s Mom and Pop Shoppe will also have two mobile fashion boutiques — a new addition to the event! But for a while, I was in a dry season of reading. I couldn’t seem to find a book to get lost in. My heart may have just been too restless. Or, I might have needed a season of quiet in the midst of all the ideas and creating I was embracing. Whatever the case, I settled into the quiet and focused on my own ideas and words. Thankfully, I’m back to getting lost in books, delighting in inspiring words on the page and that incredible new book smell. And because it’s been a while since I’ve written a book post, I thought it would be fun to share a few of the books on my reading list this month. You’re Already Amazing: Embracing Who You Are and Becoming All God Created You to Be by Holley Gerth Holley’s words are always so encouraging and uplifting, and after reading and enjoying her book You’re Made for a God-sized Dream, I decided to read her book You’re Already Amazing. Lately, the idea of comparison has been on my heart (and it came up in our An Inspired Life Book Club conversations, too). I am interested in really doing my part in discouraging comparison and building community and collaboration instead among women and artists both online and locally. I thought Holley’s book might speak to that a little and even help me to be a more confident creator for God. The Artisan Soul: Crafting Your Life into a Work of Art by Erwin Raphael McManus I’ve only read a little of this book’s intro, because I’m saving it for a time I can really sit down and dive into it, but I LOVE what I’ve read so far. I’m going to borrow a quote from the book’s description on Amazon, because I think it really sums up why I am drawn to this book. “There are no shortcuts to quality, and McManus celebrates the spiritual process that can help us discover our true selves.” I love to view creativity as a deeply spiritual process, and I’m excited to read what McManus has to say about that process. 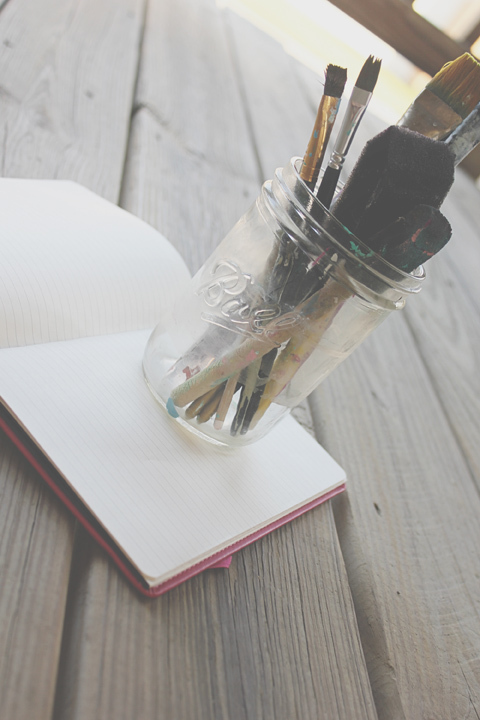 In looking at my list as a whole, it’s probably pretty evident that my favorite things to read about are the same as my favorite things to write about — art, inspiration, creativity, and living fully as the men and women God created us to be. What have you been reading lately? What kinds of books are your favorite to get lost in?